Believe it or not there were some studies done that showed benefits of “fidgeting” such as better concentration on tasks and even some physical health benefits! Well new craze is in town and it’s called EDC (Every Day Carry) Spinners. They are low tech devices that have a skate bearing (usually 608 type) in the middle and several more on the outer edges. Those outer bearings are just for weight and looks and I’ve seen others use metal balls or other weights instead. Some of these fidget toys have 3 arms (4 bearings), some have two and some have more. They are most commonly 3D printed, but some are milled from metal and wood. 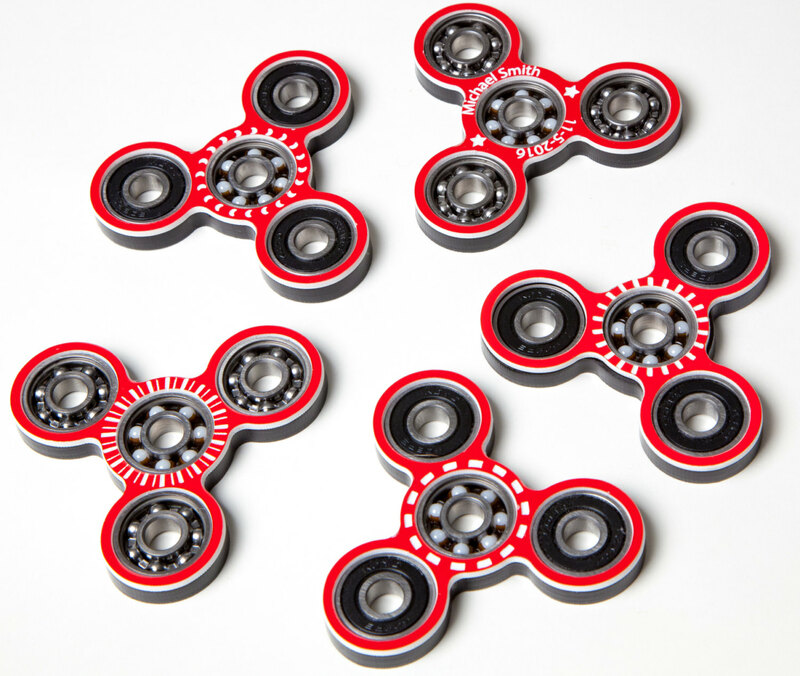 These fidget toys are good alternative to “loud fidgeting” like clicking a pen or playing with coins that might usually destruct your coworkers. I decided to get on board and spent a week designing my own fidget tri-spinner. Since I have a laser cutter, I made mine out of two pieces of acrylic. Main body is cut from 1/4″ acrylic and holds all the bearings. On top there’s a thin “skin” layer of engrave-able two tone acrylic. I’ve been playing with different shapes and sizes and various bearings until I came up with one I like the most. For main bearing I decided to use best kind – ceramic bearing. These are expensive, but they spin effortlessly and for a very long time. I also found out that removing bearing sleeves and cleaning out grease makes them spin 10x better! Since there’s no real load on these bearings, they don’t need any lubrication. I added these spinners in my Etsy shop. These are made to order, but I can usually make and ship them in just a couple of days (sometimes on the same day). Variations are in type of top engraving and type of outer bearings (open shiny metallic or closed black). I can even do small custom engraving of person’s name and memorable date or just some short message. If these start selling, I’ll start offering more color choices and I’m also working on “finger caps” (for a better grip) which I should offer as add-on soon. Another great thing about these EDC spinners, is that they light and flat and fit in padded envelope, so they can be shipped via USPS for just under $3 anywhere in the coast US!